When you ask Zulyatu what her family needs most after being displaced by Boko Haram, the answer comes to her lips instantly: abinci, the Hausa word for food. Zulyatu’s father died during a Boko Haram raid on her home village two years ago. Seeking safety, the family fled to Biu, in Nigeria’s Borno state. But her mother left the family last year to seek care for chronic health problems in another village. 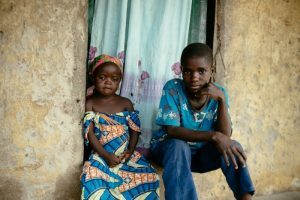 Just 16, Zulyatu is now responsible for her 12-year-old brother and 8-year-old sister. Zulyatu and her siblings are three of the nearly 2 million Nigerians facing a new crisis of hunger after being displaced by Boko Haram. She says they never have three meals a day. As a global organization delivering aid in Nigeria, Mercy Corps is among the first responders to gain access to parts of south Borno state as security has begun to improve there. But where Boko Haram has retreated, it has left a hunger crisis in its wake. An estimated 250,000 children are severely malnourished in Borno state alone. Nearly 50,000 kids are on the verge of starvation. Across the Lake Chad Basin, which includes parts of Nigeria, Niger, Cameroon and Chad, some 9 million people in areas affected by Boko Haram need emergency assistance. Last year we reached nearly half a million people in Nigeria, including more than 350,000 youth like Zulytau under 25. Today we are reaching up to 132,000 people in northeast Nigeria with lifesaving assistance. With needs so urgent and the scale of the crisis so great, Mercy Corps is focusing our response on the most vulnerable families, and we’re doing it with a simple but powerful tool: cash and cash vouchers. On a cool morning in late fall, hundreds of displaced people — mostly women in brightly colored hijabs — gathered outside their community leader’s house in a neighborhood in Biu hoping for some help. For hours they waited patiently as a Mercy Corps team member called their names, one by one, from his list. Once he confirmed their identity, they entered the courtyard to receive a voucher card loaded with 17,000 Naira, about $53. When it was Zulyatu’s turn, she pressed her thumb onto the inkpad and left her mark on the sheet confirming the receipt of her voucher card. She tucked the card away safely under her white hijab, a smile of relief spreading across her face. The electronic card, similar to an ATM card, has several benefits over traditional food distributions. It gives Zulyatu and others like her control over how they use the money. Since cash is flexible, she can use it to buy whatever her family needs most, including food, household supplies and medicine. The card is convenient, too. Mercy Corps will electronically refill Zulyatu’s account with $53 each month, so she won’t have to wait in line at the distribution again. Mercy Corps is targeting over 7,500 displaced families with cash and vouchers in Biu alone, so they can meet their most urgent needs. The idea is to help these families stabilize immediately so they can begin to build a stronger future. Zulyatu hailed a rickshaw and headed straight to the main market. To newcomers, Biu’s main market is crowded and chaotic, with stalls and shops selling all kinds of food. Zulyatu wound her way through alleys looking for a particular shop to buy food for her family. The liveliness of this market is one of the reasons Mercy Corps is using cash to help people here. Traditional food aid, in the form of food bundles distributed to hungry people, is necessary in areas where conflict or crisis destroys markets. But that same aid can have a devastating impact on local economies if markets like this one are working, since it distorts the supply and demand for food. Instead, Mercy Corps has enlisted more than 30 local shop owners to participate in the voucher program. They agree to sell food and other household necessities at reasonable prices, and Mercy Corps equips them with a tablet they use to process the voucher cards. Zulyatu checked the prices for the staple foods she wanted to buy, ensuring the food she bought would be able to stretch until her next voucher top-up. She settled on 60 pounds of rice, one carton of spaghetti, salt, groundnut oil and a popular Nigerian seasoning. It is a modest menu, but from it, Zulyatu knows she and her family will eat three meals a day. At home, Zulyatu and her neighbor, Habiba, prepare a meal. Habiba and her young family also escaped from Zulyatu’s home village, and though they all share the same struggles, they support each other, too. They grind up the spicy red peppers that give Nigerian food its signature heat and cook the rice over a small fire. When the rice is done, she pours it out onto a big, round dish and tops it with the pepper sauce. Both families gather around it. The future is unclear for Zulyatu’s family, and for so many others like them. But now they have food, which she says is a good place to start. Together, they begin to eat.